Virginia Beach Blazers Basketball has grown into a positive environment that teaches as much about life as it does about basketball. Virginia Beach Blazers Basketball strives to produce well-rounded and motivated individuals who show responsibility for their community. Our players are held accountable for their behavior as a part of our organization, for their efforts at home and for their academic performance. Participants learn to be disciplined, hard-working, and fair. Above all else, Virginia Beach Blazers Basketball provides for its players positive exposure to a diverse collection of cultures and socioeconomic backgrounds. Our goal on the court is to teach our players the complete game, so that they will be prepared for middle school basketball and beyond. Individualized skills instruction is on going as is the development of the team concept. Higher level skills are broken down, and coaches will often pose questions to the players to help them analyze and understand the game. All players are required to exhibit positive attitudes towards others. Coaches and volunteers provide guidance and serve as role models for each player. The Blazers are expected to respect themselves, their teammates, coaches, competitors, and all others. Mentoring, coaching, and teaching is done in a positive learning environment with emphasis on building players self-esteem and confidence. The intent is to improve the players current attitude and build a foundation for the future. It all starts with attitude. The Virginia Beach Blazers organization was established to provide advanced training and skills development that promotes both individual and team success in highly competitive games and tournaments. 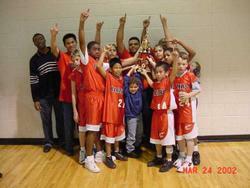 The Virginia Beach Blazers is an Amateur Athletic Union (AAU) sanctioned team. AAU teams are some of the most competitive in the United States. The Blazers participate in sanctioned practices, games, and tournaments including an annual nationwide tournament that starts with regional qualifiers held every spring. Participation in local, area, and national events increases individual and team skills, prepares players for school team tryouts. The Virginia Beach Blazers organization provides resources and guidance to assist players with achieving their academic goals. Each player mustpresent their report cards to coaches during each grading period. Weaknesses are identified and the player and mentor will design a plan for improvement.